Honor and Protect Preemies Today! You may not, but you should because today is a day to honor a baby that you may have had or know very well - a preemie. Today (November 17th) is Preemie Awareness Day or World Prematurity Day and I am so honored to be able to share some useful information with you about Preemies and RSV and be a little voice for those little ones that can't speak for themselves! Did you know that worldwide, 13 million babies are born early every year, including more than half a million in the United States? WOW!!! Isn't that a crazy fact??? That is a HUGE number and almost scary! Sadly, despite these staggering numbers, many parents still aren’t aware of prematurity—the leading cause of neonatal death. In fact, a recent survey on prematurity awareness found that 3 in 10 mothers of preemies weren’t aware of the possibility of prematurity until they had their first child. 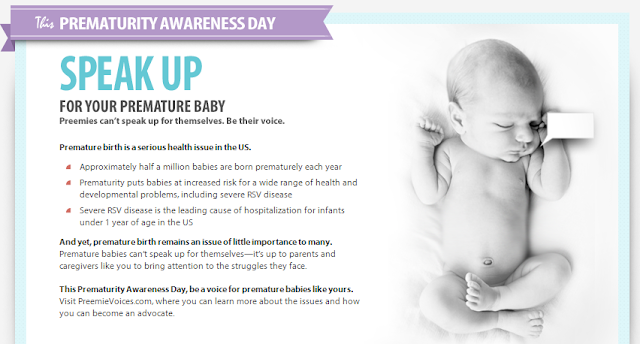 And 75% of parents don’t know the definition of prematurity-- being born at or before 37 weeks gestation age. Given this low awareness, it is clear many parents don’t fully understand the increased risks that come with premature birth – and the specialized health care that preemies often require. That is why I have made it my mission today to share some important facts so that you can educate yourselves and others! So why is prematurity such a big deal?? Well, Prematurity disrupts a baby’s development in the womb, often stunting the growth of some of the body’s most critical organs like the heart, brain, muscles, etc. Sadly, these babies are at an increased risk of serious medical complications and regularly face weeks or even months in the NICU. This often contributes to mothers feeling powerless, anxious and isolated. My two children were not born prematurely but I know from friends that have had premature babies the time in the hospital can be so trying, especially if you have other children at home missing their parents! I have friends that had their twins at only 23 weeks!!! Sadly, one twin passed away but the other one had to stay in the hospital for over 20 weeks! It was a rollercoaster of a time with many peaks and valleys, highs and lows but by the grace of God she is now a healthy toddler! However, even after they got her home they couldn't leave their house for the entire winter because of the risks of RSV during cold and flu season! Respiratory Syncytial Virus, also commonly known as RSV, is contracted by nearly all children by the age of two, often causing relatively minor symptoms that mimic the common cold. However, preemies are most at risk for developing much more serious symptoms, including a serious respiratory infection (severe RSV disease) from the virus, because their lungs are underdeveloped and they don’t have the antibodies needed to fight off infection. Because their immune systems and lungs aren’t fully developed, preemies are more likely to develop infections and are more susceptible to respiratory problems. In fact, 79 percent of preemie moms have a baby who was hospitalized due to a severe respiratory infection. Check out these great RSV Quick Facts and keep them in mind next time you visit, have, or know a preemie! · RSV is the leading cause of infant hospitalization, and severe RSV disease causes up to 10 times as many infant deaths each year as the flu. 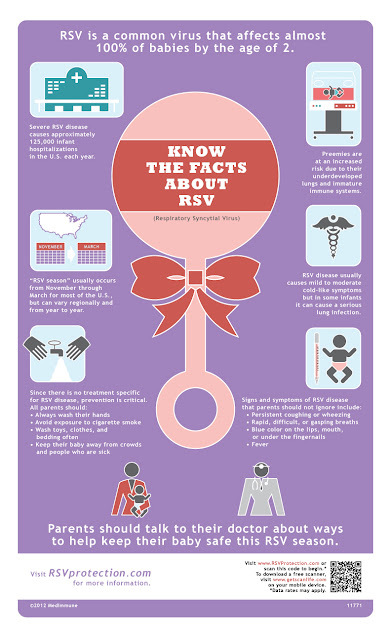 · RSV is most prevalent during the winter months. The CDC has defined the “RSV season” as beginning in November and lasting through March for most parts of North America. · In addition to prematurity, common risk factors include low birth weight, certain lung or heart diseases, a family history of asthma and frequent contact with other children. So how do you watch out or prevent RSV?? With winter approaching and the impending Cold and Flu season, there are many babies and children that will be exposed to RSV and other sicknesses! Make sure to read these tips and info, get educated and prevent your children from getting RSV this winter! Plus, keep any preemies you know in your prayers as you remember and honor them this Preemie Awareness Day!